Hi, luvs! I’m in such a good mood today and am having a great day. I don’t always do OOTD posts because since I started this as a sewing blog, I sometimes forget that you guys might benefit from some of my great RTW finds too. Now I wouldn’t necessarily describe myself as a bargain/budget shopper, however I do love a good deal, especially when it comes to clothes because as a seamstress, I just find it very difficult to pay full retail prices for things that I could simply make (if I had the time). I do however buy a lot of basics because I don’t find it quite as fun sewing them. If you don’t sew, or if you don’t want to sew every outfit, you still don’t have to break the bank to look pulled together. I put this outfit together for $55 for everything other than the shoes. The jeans are from F21, the basic turtleneck is from Wal-Mart (Tip: For a roomier fit, check out the men’s department for basic layering pieces like this. There is usually a broader size range, and they are usually cheaper as they don’t generally price gouge men the way they do plus-size women) and this color-blocked moto jacked is a Target find from a year ago add my oldie but goodie Steve Madden booties and I was ready to go. So I got a little behind because, well you know, life gets in the way, and I hadn’t been able to find my usual 30 min to sew. 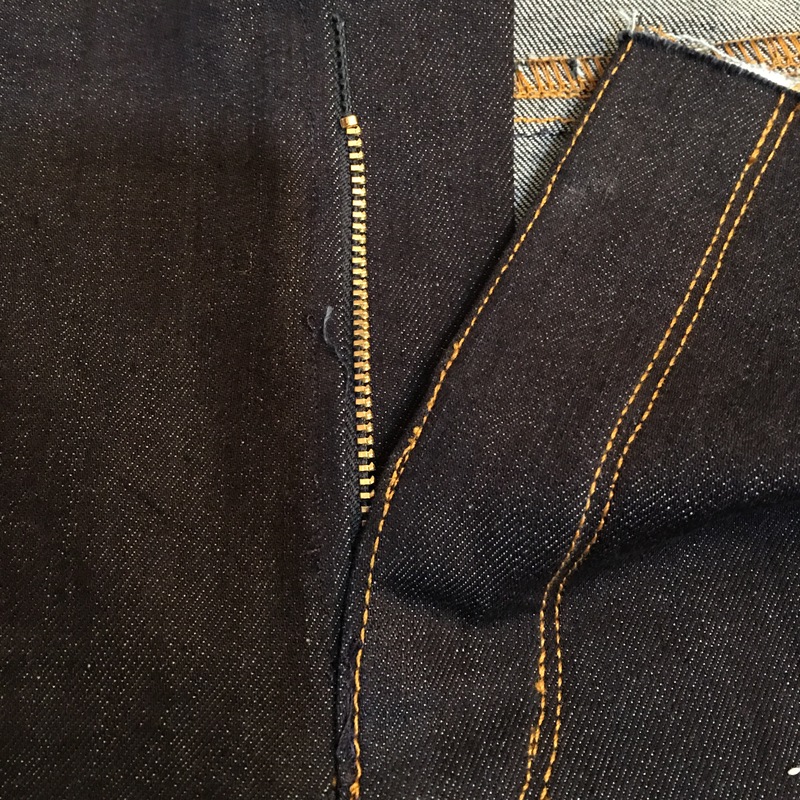 This week, we attached the front to back, topstitched the inseam, down the side seam, created bar tacks and attached and topstitched the waistband. I wanted to be sure when I tackled the waistband I was fully alert so it took me a little longer to get to it. After I attached the front of the pants to the back, I tried them on for fit and they are pretty near perfect. I was most impressed because even without the waistband I can tell that the rise of the jeans is high enough so that I won’t be worried about flashing folks all day but not so high as to be “mommy jeans”. As I have mentioned previously, the sewing itself is pretty basic stuff it’s just the amount of details due to the topstitching and all the moving parts, i.e. Coin pocket, back pockets, front pocket yoke, pocket bags, etc. Take a look at that inseam topstitching. All in all I love these pants and will surely make many more but I’m looking forward to a few instant gratification projects next.